My twin sister went to ASU and would request records all the time. The librarians seemed amused by it. This was one of the albums I remember and like. 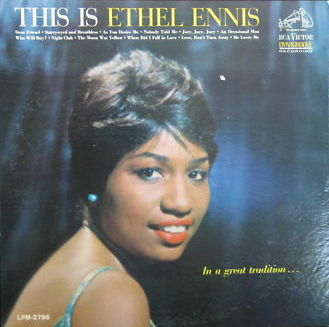 Ethel Ennis is a good singer. She has good pronunciation and a feel for jazz. The Moon was Yellow is easily the best song, an interesting ballad. There is the right mix of uptempo and slow songs. It makes good night time listening. I like her version of Who will buy? Her earlier albums are worth investigating too. I'll review one another day.